If you live within the surrounding areas of Lafayette IN, Indianapolis IN, Chicago IL, Springfield IL or St Louis MO -- you are invited to host a Paint for a Purpose party to support the orphans! ONE: Host a "Paint for a Purpose" party at your home, office, or other venue! All materials required to paint (canvases, brushes, and paint) will be provided along with complimentary wine. "Artists" will paint free-style* for a donation of $25 each. You need only invite guests! All other details will be taken care of. Painters will keep their masterpieces. *for an additional $5 charge per person, the canvases can be pre-sketched out to help facilitate the painting process. ​TWO: Host a "Paint for a Purpose" party at your home, office or other venue and donate your paintings to Swaziland. 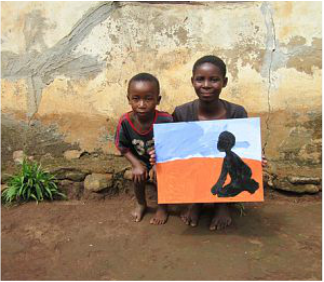 You will receive a photo of the orphan who received your painting like Mazwi, the boy seen below. Similar to the Paint Party above, GHFP will bring all of the supplies necessary for you and your friends to paint "masterpieces" (no artistic skills required!). A donation of $35 per person* is required (the additional cost will cover transportation of your canvas to Swaziland). **We can customize any bachelorette party, baby shower, wedding shower, birthday, or even just a girls night event!